Thanks to Durban’s well established road infrastructure, and the proximity of the Durban ICC to most of the city’s major landmarks and tourist attractions, getting to and from the Centre, whether by hire car or public transport, is easy and stress free. 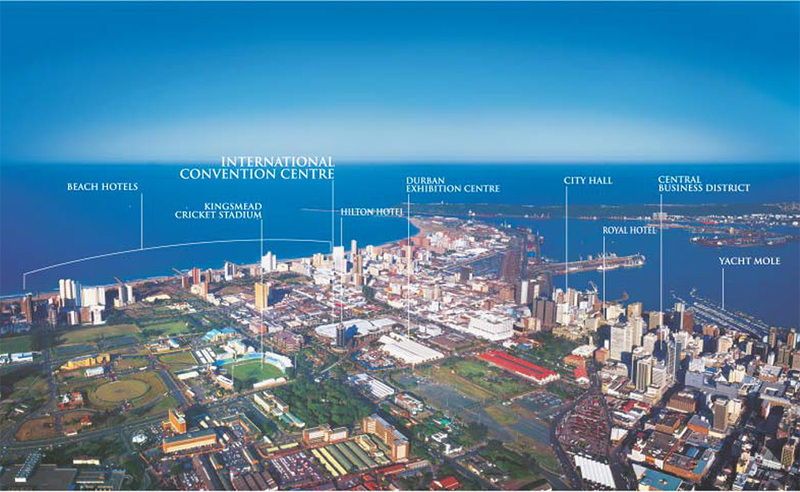 Durban ICC is located in the centre of Durban, at 45 Bram Fischer Road, (old Ordnance Road), and is just a half-hour drive from the King Shaka International Airport. A short walk from the Durban ICC will take delegates to the stunning beachfront, tourist attractions and some of the city’s top hotels. For any further assistance with directions, please call +27 (31) 360 1000. Follow the Inkosi Albert Luthuli Freeway M4 (Southern Freeway) in a northerly direction. Approaching Durban take the Esplanade Turn off, this will take you along Margaret Mncadi Embankment (Victoria Embankment). Turn left into Stalwart Simelane Street (Stanger Street), and proceed straight until you see the Durban ICC on the left-hand side. The entrance to parking is on the corner of Stalwart Simelane Street (Stanger Street) and Bram Fischer Road (Ordnance Road). Follow the Western Freeway N3 in an easterly direction, proceeding straight over “spaghetti” junction and the Tollgate Bridge. Take the Old Dutch/Alice Street slip road left, and follow the signs to the Beachfront and Major Hotels. This will bring you into KE Masinga Road (Old Fort Road) take a right into Florence Zama Street (Prince Alfred Street). Take the next right into Bram Fischer Road (Ordnance Road), keeping in the left lane. The entrance to parking is on the corner of Stalwart Simelane Street (Stanger) and Bram Fischer Road. Follow the N2 Northern Freeway in a Southerly direction. Approaching Durban take the Mt Edgecombe/Umhlanga slip road, heading towards the sea. Follow the signs to Durban and proceed along the Ruth First Freeway M4 (Northern Freeway) past Virginia Airport and Durban North. On approaching Durban, proceed straight over the Sandile Thusi Road (Argyle) intersection and turn right onto Bram Fischer Road (Ordnance Road). The entrance to parking is on the corner of Stalwart Simelane Street (Stanger) and Bram Fischer Road. Please note, if you follow the N2 around the city instead of taking the directions above for North and South Coast, you can still follow the Inland directions, but on approaching ”Spaghetti Junction”, follow the signs for Durban, which will take you onto the N3.